Gold usually loses to stocks, and gold-mining stocks can often be even worse. But gold stocks can still serve a place in your portfolio if you buy the right ones. Stock jockeys like us tend to bash gold as an investment -- and for a litany of reasons, including poor performance as compared to stocks and a lack of predictability as to its value, largely because of speculators, not buyers for commercial or industrial use. Furthermore, no less than Warren Buffett has pointed out the many reasons gold isn't something he's particularly interested in investing in. However, that doesn't mean all gold stocks should be avoided entirely. After all, as an asset that's entirely uncorrelated to stocks, gold can help investors hedge their portfolios against market crashes, and just like any other industry, there are excellent companies in the gold mining and miner financing space that have delivered incredible returns. Three Motley Fool contributors have identified iShares Gold Trust (NYSEMKT:IAU), AngloGold Ashanti Limited (NYSE:AU), and Franco-Nevada Corp. (NYSE:FNV) as gold stocks worth watching now. Whether they make sense for your portfolio depends on your objectives, but they all have a compelling story. Jason Hall (iShares Gold Trust): If you're looking for a way to diversify your exposure to stocks, then gold -- as an asset class all its own -- shouldn't be completely disregarded. 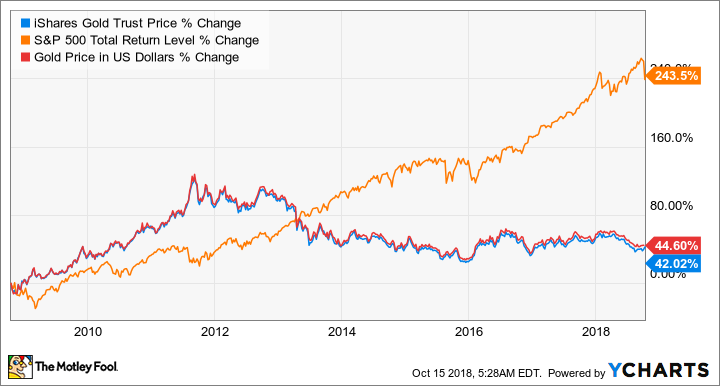 One simple, relatively low-cost way to acquire and hold gold is the iShares Gold Trust, which makes it easy to own something that's pretty uncorrelated with stocks. This trust acquires and physically owns gold, secured in vaults around the world, charging investors 0.25% of assets held per year to cover expenses. While this isn't a "zombie apocalypse" way to hold gold (you can't physically take it out), it can be an excellent way to own an asset that doesn't move in lockstep with stocks. According to iShares, the Gold Trust has a beta of -0.02. That's incredibly uncorrelated to stock price movement. Here's the catch: Historically, gold has almost always underperformed stocks as a long-term investment. Gold's short periods of outperformance are when the stock market falls, in part because gold becomes a more attractive asset to hold during stock market uncertainty. But since stocks tend to go up far more often than they go down -- around seven in 10 years, on average -- the odds aren't in gold's favor as a long-term holding. But if you're concerned the recent decline in stocks could become a protracted drop, putting some cash in the iShares Gold Trust is one way to hedge your portfolio. It's not a strategy I'd use with a substantial portion, but buying a small amount to redeploy into stocks if the market does fall could lead to even bigger profits. Rich Smith (AngloGold Ashanti): I've said it before and I'll say it again: I'm not a huge fan of gold stocks as a rule. Still, a bargain's a bargain, and when I find a stock -- even a gold stock -- selling for an attractive price, that gets my interest. Earlier this year, fellow Fool Neha Chamaria drew my attention to a list of five gold stocks that had been punished especially harshly this year. Reviewing the list today, I note that one of these stocks in particular -- South African gold miner AngloGold Ashanti -- is sporting some particularly attractive numbers. Although only barely profitable from a GAAP perspective, AngloGold generated an impressive $265 million in positive free cash flow over the past 12 months. Weighed against its $3.6 billion market cap, that works out to a valuation of only 13.6 times FCF. True, AngloGold carries a hefty helping of debt -- $1.8 billion net of cash -- which raises its enterprise value. On the other hand, though, AngloGold's new CEO has been making noises about selling off noncore assets to raise cash, which could then be deployed to pay down debt without hurting growth rates too much. Speaking of which, analysts who follow AngloGold stock are forecasting some truly amazing earnings growth rates, in excess of 100% annually over the next five years. That fact alone might win AngloGold a slot on your watchlist. Tyler Crowe (Franco-Nevada): Gold is just like other mining businesses in that it takes massive capital investments up front to get a project started. Capital doesn't grow on trees, and the cyclical nature of gold and other commodities means that miners can't saddle themselves with too much debt. As a result, many miners turn to streaming companies for alternative financing options. Instead of taking interest payments, streaming companies negotiate to buy future gold, silver, and other precious metal production from a prospective mine at heavily discounted prices in exchange for an up-front investment. By locking in low-cost sources of precious metals for years, streaming companies are some of the most stable investments in the gold industry. Sure, their revenue will go up and down with the price of precious metals, but the cost at which they buy it almost guarantees a healthy profit margin. 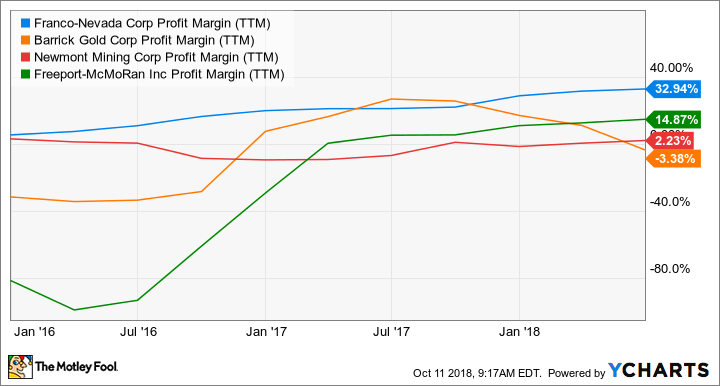 FNV Profit Margin (TTM) data by YCharts. Shares of Franco-Nevada are by no means cheap at 52 times earnings, so investors probably shouldn't be running to their broker to buy shares. That said, investors looking to make an investment in gold will likely get much better results looking at Franco-Nevada than at miners or direct investments in gold itself.